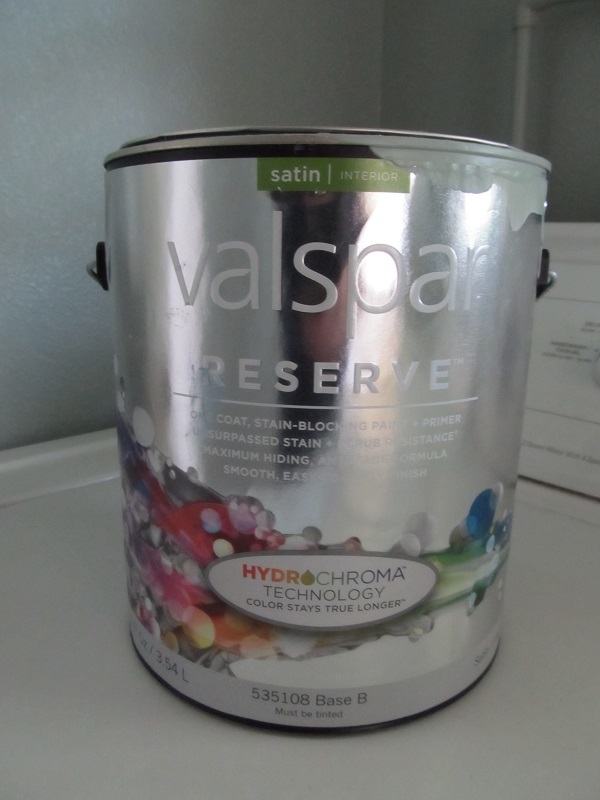 Disclosure: Valspar sent me a gallon of Valspar Reserve with HydroChroma technology for the purposes of this post. I was approached by Valspar to review their new line of paint Valspar Reserve. Once I decided which room I was going to do, I had to decide on the color. Honestly, for me that is the fun part. I headed to Lowes for a few samples, thinking I wanted to go with a bold color I picked up samples for a bright royal blue, a Kelly green and a hot pink. I go them home, painted a few squares to see which I liked and ultimately decided they were too bold. I love color, but tend to opt for more muted colors. Eventually, I choose a fabulous grayish blue called Hot Springs. I was very excited to get the box of Valspar Reserve paint. Anxious to see what the color would like on the wall I tested a sample on the laundry room. It dried a tad darker as paint does but as I suspected it is a soothing color and perfect for the small space. I have been working on finishing the room this week. I must say it is different from other paints I have used. Valspar Reserve is a primer and paint in one so all you really ought to need is one coat. Most paints are a bit runny, but Valspar Reserve is thick and a bit goopy. It’s one of its best features in my opinion. It covers well and I only needed one coat in most areas. We have textured walls and a regular paintbrush was not quite up to the challenge. I had to switch over to a roller for better coverage. As I poured it in to the paint pan, it struck me that the paint was not spreading. Like pudding in a bowl, the paint just giggled in the pan. It was stuck in the cervices and even tipping the pan the paint would not move. Unlike regular paint the thicker consistency allowed for the roller to absorb just enough without dripping all over the place, which was a bonus, as clean up was very simple. It has dried quickly and with very little smell. The project took a few days to complete and it had been a few weeks since it arrived so I expected the gallon of paint to need a good stir. If you have done any painting you know that paint when left alone tends to need to be mixed again as the colors separate. I was pleasantly surprised to find that was not the case with Valspar Reserve. The colors never separated, and there was never a layer of liquid on top. So far I am impressed with the brand. 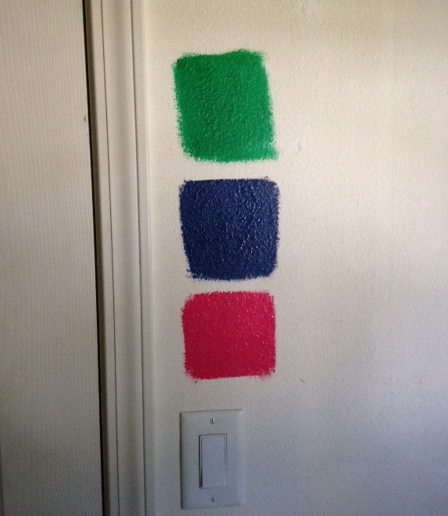 I have used other lines of Valspar paint in our house and it’s been one of the go to brands for us. I like that it is readily available at Lowes. Paint comes in a wide range of price points and while Valspar Reserve in my opinion is a bit pricey, it’s worth every penny. I wouldn’t opt for it if I were painting furniture, but for the walls of a busy home I wouldn’t hesitate if it fit the budget. It’s important to me that the first room we walk into from the garage is clutter free and welcoming. So, the room is still a bit of a work in progress. Curtains, and shelving need to be hung. I need to find an area rug and a few accessories to complete the look. Once the final touches are installed I will reveal the completed room. We bought Valspar Reserve in a deep red (Spanish Tile) for our kitchen cabinets. It has taken three coats to cover, whether over the previous paint (a forest green) or over primer. It takes at least a day to dry where the color does not rub off. Not very pleased with it. Bill, I am sorry you had a bad experience with the Valspar Reserve paint. It’s a latex paint and not ideal for kitchen cabinets. Try using an oil based paint, enamel or waterborne alkyd like Benjamin Moore’s Advance. It dries harder and is more durable for trim, molding, and kitchen cabinets. 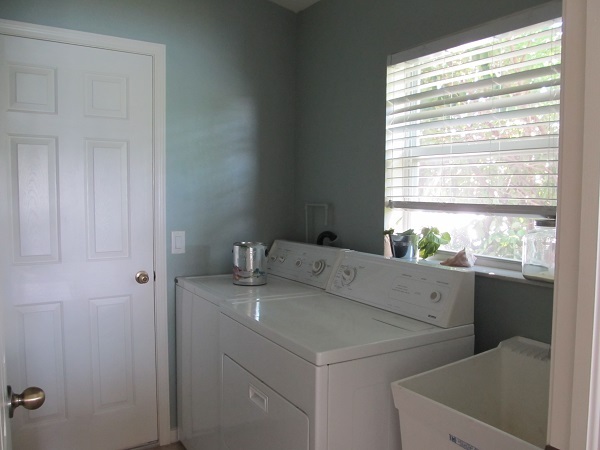 I painted our laundry room a year ago and the Valspar has held up very well.